Now that the new year is officially upon us and the first few months seems to be the focus of getting all healthy and fit, I feel like I need to make an effort to eat better. Don’t get me wrong, I try to watch what I eat most of the time. But now that everyone is on the kick of working out and eating healthier, it gives me just a little more motivation to do so. 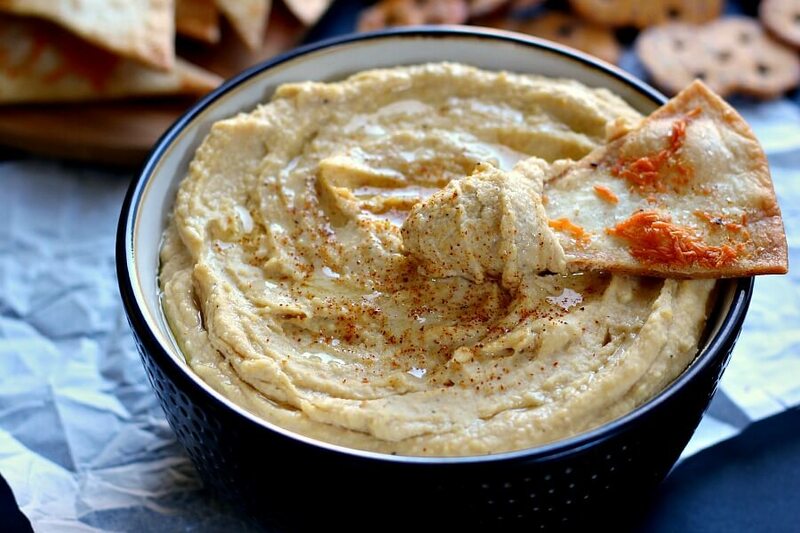 One of my favorite dips to eat that’s on the healthier side is hummus. I simply can’t get enough of it and have been known to eat more than my fair share in just one sitting. I go through hummus like nobody’s business and am not ashamed to admit it. So after I received a new food processor for Christmas (it was a sad day when my old one broke), I decided to make this Whipped Garlic Hummus with Parmesan Tortilla Chips. Healthier than the store-bought kind and so easy to make, this hummus is my new favorite dip! And because tortilla chips are often my choice to dip into, I decided to make my own chips. And they’re super easy to whip up! If you’ve never made your own hummus before, then your totally missing out. Not only is it a breeze to whip up, but it requires just a few simple ingredients! And since I’m the biggest garlic addict around, making this Whipped Garlic Hummus was a no-brainer. So let’s get down to the recipes! To make this Whipped Garlic Hummus, you need just a few simple ingredients. The only thing that you may not have in your kitchen is tahini paste, which is a necessity to make this delicious dip. You can find it in the ethnic aisle of your grocery store, in the Mediterranean section. Simply combine a can of chick peas, tahini paste, olive oil, lemon juice, minced, salt, and pepper into the food processor. Pulse until it reaches your desired consistency and your healthy snack is ready to be devoured! The creamy garlic flavor and smooth texture of the chick peas creates a delectable, yet healthy dip that is perfect to serve with pita chips, carrots, or peppers. 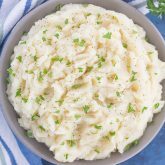 Drizzle a little olive oil on top and sprinkle on some crushed red pepper, and you have the easiest and tastiest Whipped Garlic Hummus that is perfect to jump-start the road to a healthier you! Healthier than the store-bought kind and so easy to make, this Whipped Garlic Hummus will be your new favorite dip! In a good processor, combine the chick peas, tahini paste, olive oil, lemon juice, minced garlic, salt and pepper. Pulse until it reaches your desired consistency. The longer you blend it, the creamier the mixture will be. Pour mixture into a dish and top with a drizzle of olive oil and some crushed red pepper, if desired. To make the tortilla chips, preheat oven to 350F. Cut each tortilla shell into six wedges. Place onto prepared baking sheets and lightly brush both sides with olive oil. Sprinkle garlic powder, Parmesan cheese, and sea salt over chips (flip over if you would like both sides coated). Bake for 12-15 minutes or until chips are crispy and golden. Hummus will keep refrigerated for up to two weeks. 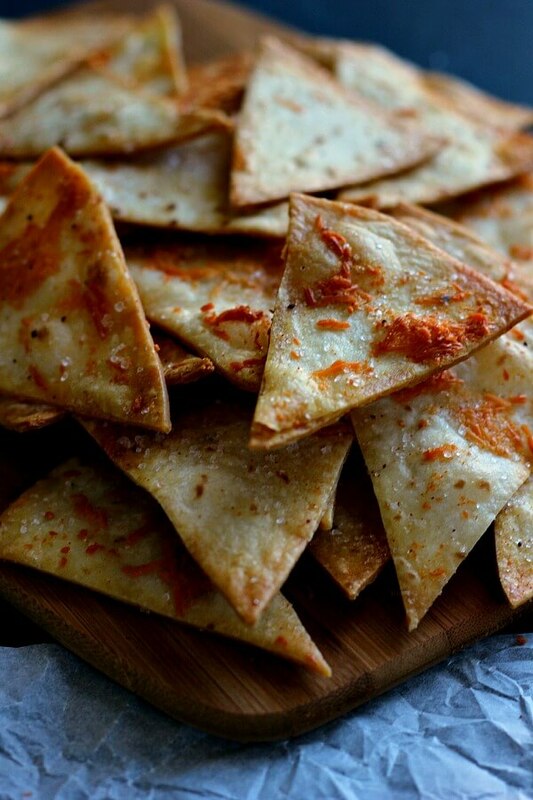 The only thing better than a pita chip is a tortilla chip with parmesan! All of this looks so great. And the eating healthy thing is easy when food is this delicious! 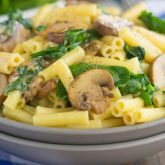 I love how you through me for a tail spin with this recipe Gayle! I wasn't expecting hummus, thanks for sharing. Been meaning to make some, although I've never tackled it. Thanks for the inspiration! And those tortilla chips, they just look fantastic, don't you just love anything Parm! Addicting. You know, even though I can by chips for 2 for $5, that's only when they are on sale and we go through both bags ! And they are only "ok" Your chips look fantastic, haven't made those either but now I need to try! Thanks so much, Laura! I was amazed at how easy tortilla chips are to make! I love the store-bought kind too, but I'm definitely going to make my own more often! This looks wonderful! Love homemade hummus and the homemade tortilla chips just make it that much better! Great for healthy snacking, Gayle! The first time I tried hummus, I fell in love with its creamy garlic-y flavor, I was 19, and I've never looked back! But your chips could easily become a new love! These chips and hummus are the perfect pair, Annie! Thanks! 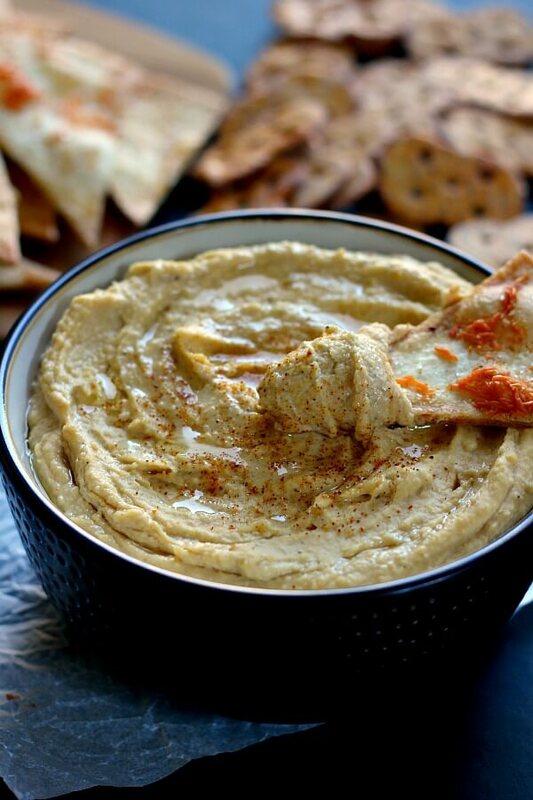 Garlic hummus is the best ever and yours looks SO creamy and delicious! Oh, gosh. Hummus is my WEAKNESS, but combined with garlic and those delish-looking parmesan chips?! I die. Well, after I eat an entire bowlful of the stuff that is... :D This looks absolutely fabulous, Gayle! Oh man, I go through store-bought hummus way too fast, Sarah! And this homemade kind is even better. Thanks for the kind words! Gayle, I think I could give you a run for your money in the hummus department! :P Between my kids and I, we go through hummus like nobody’s business too! :) and oh my gawd, I love the hummus but I especially love the Parmesan Tortilla Chips!!! whoa, those look so good and I love the color from the grated parmesan. . those are gorgeous!!! Why is hummus just so darn addicting?! :) I think you and your kids would love these chips, too! They're the perfect crunch to dip into! I love snacking on hummus! Yours look perfect! Thanks, Jessica! Hummus makes the best snack! We love to snack on hummus! Your garlic hummus sounds phenomenal and those parmesan chips wouldn't last long around here. I'd gobble them right up. They look delicious! Oooh the boyfriend would love me for making this! He's a huge garlic fan. And I love the idea of a healthy snack, so this is a no-brainer for us! Sounds like the perfect snack, Sarah! I love garlic, so I try to sneak it into anything that I can! I totally agree Gayle! Just recently started making hummus at home and it is so quick, easy and inexpensive. Need to try this whipped garlic one asap! Pinned! Thanks for the hummus love and pin, Mira! I can't believe how easy hummus is to make! YUM!! I LOVE hummus!! This looks delicious! Great recipe!! I adore hummus, and it's simply incredible when you DIY. This is an inspiring and tasty-looking snack! These pictures are just too pretty Gayle! I want to reach thru the screen and take a scoop out of this! I love home made hummus!! It is seriously the best! How funny that I was just thinking that I need to post a hummus recipe on the blog and here you are! ;) Love the home made pita chips too. Never made those before and you make it looks easy and yummy. Pinned! Homemade hummus is the best, Cyndi! Thanks for the kind words and pin! Homemade hummus is our favorite! We go through so many batches too that sometimes I'll just buy a package whenever I"m too lazy to make more haha. Yours looks absolutely perfect! I love how creamy it is and those homemade pita chips look positively irresistible! Thanks, Kelly! I'm loving homemade hummus! 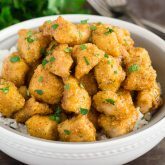 So easy to make and so full of flavor! From the hummus to the chips, it all looks delicious! Gayle those tortilla chips look so crispy and all that cheese - just yumm! Homemade hummus is the BEST! I always love making it nice and fresh :) pinned!! I agree, Medha! 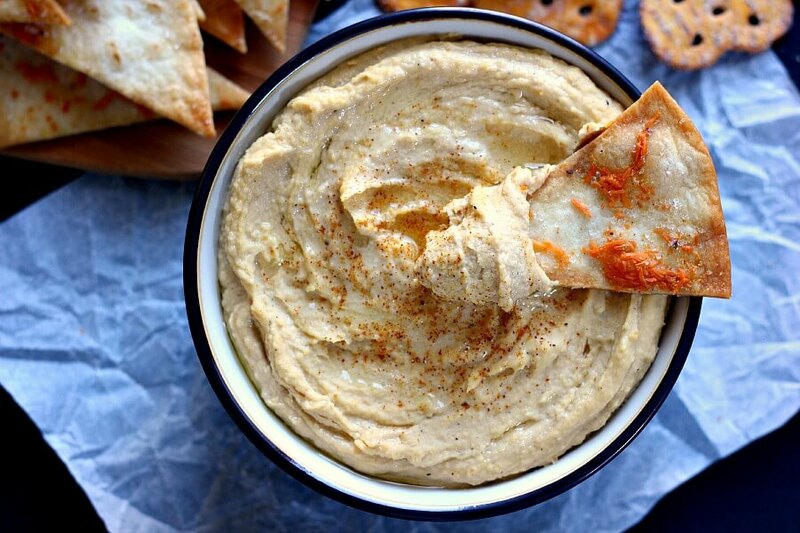 Homemade hummus is definitely better than the store-bought kind! I hope you love this if you try it! I usually get frustrated with the texture of my homemade hummus but "whipped" makes this sound creamy and amazing! Loving it! Have you ever tried shelling the chick peas or do you find that you don't have to? Thanks, Andrea! I find the longer your blend the ingredients, the more creamy the hummus gets. I actually have never shelled the chickpeas before when I've made hummus. Have you tried that? I'd be curious to see if it comes out differently! Garlic + hummus + parmesan chips...perfection, Gayle! I love hummus as a healthier snack option too. I have never made my own hummus but you make it look easy! Pinned! And those chips...yum!!!!!! What a creamy hummus! And those tortilla chips look out of this world! I love that you make your own chips here. I make pita chips myself and they are so delicious and so simple. Maybe we can start a homemade chip revolution! I'm all for a chip revolution, Shelby! Thanks! I was surprised how quick and easy it was to make hummus the first time I made it. So easy! This hummus looks so good, and I love those parmesan tortilla chips! I've never made my own tortilla chips, i will definitely have to try that! Thanks, Stacey! These chips are super easy to make and so full of flavor! these tortilla chips sounds delicious ;-) and hummus o-m-g!!! it never lasts long! lol so many things are de-lish with hummus! YUMMMM! I love hummus, too! This one looks so perfectly smooth and creamy! And those chips look just perfect! Homemade is always better! Thanks, Jess! I agree, you just can't beat the homemade stuff! Such a great picture of the hummus! 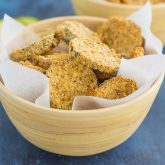 I'm going to have to try this and the parmesan tortilla chips - I have used that trick to make cinnamon sugar tortilla chips but never thought to use it for more cheese! Thanks, Kelly! 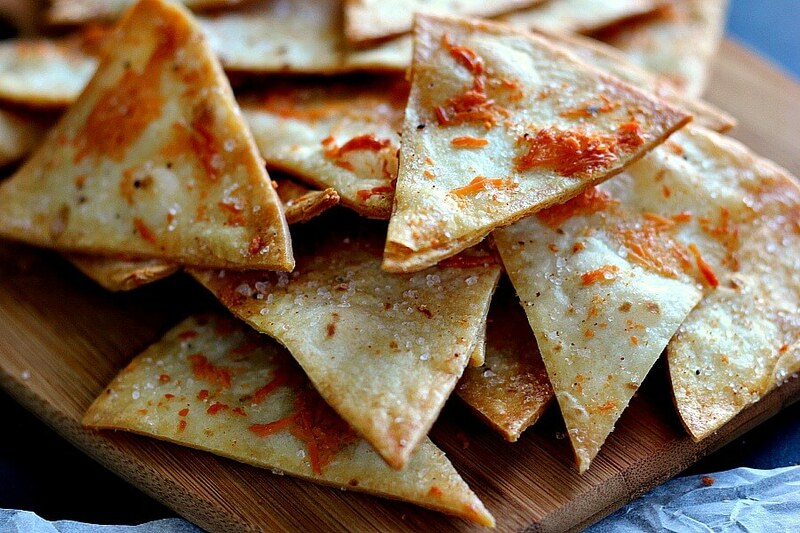 I think you'll love the parmesan tortilla chips! I love dip and crackers (especially when it's accompanied by a good glass of red wine). I have to make this delicious whipped hummus and the crunchy tortilla crackers too Gayle. Just beautiful! Thank you, Thalia! Red wine would be perfect with this snack! Hummus is my favorite lunch condiment. It travels well in the lunch box and tastes delish! I agree, Kathy! It's so versatile and delicious! I love hummus too - such a great snack! I've never made it, but I want to! This garlic hummus looks amazing and I love the parmesan chips - yum! You would love these tortilla chips, Ceara! They're crunch and so full of flavor! Can't even lie... I am super in the mood for these chips now, and its not even 9 AM. Pinning! These make a great breakfast! Thanks, Jacqueline!